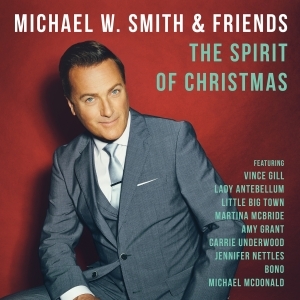 Michael W. Smith invited A-list artists Vince Gill, Lady Antebellum, Martina McBride, Carrie Underwood and other best-selling singers to join him on his upcoming Christmas release, Michael W. Smith & Friends: The Spirit of Christmas, due in stores Sept. 30. Three-time GRAMMY-winner Smith also partners with longtime friend Amy Grant, U2 frontman Bono, Jennifer Nettles, Little Big Town and Michael McDonald on the holiday release. Smith will launch "The Spirit of Christmas Tour" later this fall, including co-billed shows with Amy Grant in Dallas, Minneapolis and Atlanta. “This is the most unique and unusual record I've ever done in my 31-year career,” Smith said. “The entire record was sequenced together before we recorded one song…There’s my granddaughter’s voice singing the song from Home Alone, plus the whole orchestral and symphonic feeling of Christmas, mixed together with all these amazing voices and guests--yet it all fits together in a remarkable way." Rolling Stone Country announced the new album’s release with a behind-the-scenes video trailer of the recording sessions. Michael W. Smith & Friends: The Spirit of Christmas is Smith’s fourth Christmas project, which also include Michael W. Smith Christmas (1989), Christmastime (1998) and It’s A Wonderful Christmas (2007). CMA Awards and CMA Country Christmas producer Robert Deaton saw Smith’s performance with Jennifer Nettles during the 2013 CMA Country Christmas television program and suggested to Smith that they create a full Christmas recording as co-producers. The two added renowned orchestral maestro David Hamilton as a third co-producer, who arranged and oversaw the London Symphony Orchestra’s recordings on the project. “When we started talking about who could be on this record with him, the list got really narrow really fast," remarked co-producer Robert Deaton. "There’s a difference between a singer and an artist, or a celebrity and an artist. While we were fortunate to have these amazing guests on the record, it all feels like a cohesive piece and you never leave the fact that it’s a Michael W. Smith record. That was important. That, along with working with co-producer David Hamilton, who is the resident genius, was amazing. This entire process has just been phenomenal." Smith and Deaton say they were inspired by the original Carpenters Christmas album, wanting nostalgia to hit listeners right at the top of the record. Beginning with the childlike and wintry aspects of the start of the Christmas season, the collection evolves with songs and instrumentations reflecting the true meaning of Christmas with the celebration of family and faith, concluding with what Christmas brought to the world, the birth of Jesus. Songs include “Christmas Time Is Here” featuring Vince Gill, “White Christmas” featuring Lady Antebellum, “Silent Night” with Little Big Town, “All Is Well” featuring Carrie Underwood, “What Child Is This?” featuring Martina McBride, and “The Darkest Midnight,” with spoken word by Bono, plus others. To date, the three-time GRAMMY Award-winning Smith has sold more than 15 million albums, achieved 28 No. 1 singles, and received more than 40 Dove Awards. Tickets for “The Spirit of Christmas” shows are on sale now. For a full list of tour dates, and ticket information, visit michaelwsmith.com/tour.